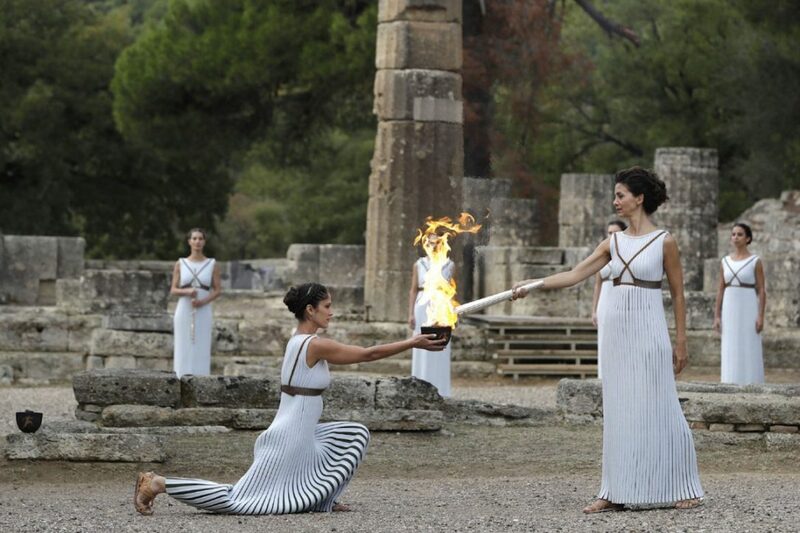 The flame for the 2018 Pyeongchang Games has been lit in the birthplace of the ancient Olympics. Using fire from a previous rehearsal because of rain during the actual ceremony, an actress playing an ancient pagan priestess ignited the torch in front of the 2,600-year-old Temple of Hera. From Ancient Olympia, where the Games of antiquity were held for more than a thousand years, the flame will travel through Greece for eight days and reach South Korea on Nov. 1. Despite tensions between the U.S. and North Korea—with which the south remains technically at war—organizers insist there is no fear for the Feb. 9-25 Winter Games. “We want the international community to understand that we are committed to hosting a safe and secure” Games, organizing committee chief Lee Hee-beom said during Tuesday’s lighting ceremony. The ski resort town of Pyeongchang lies about 50 miles south of the world’s most heavily armed border that divides the two Koreas.